Following on from the last post – it’s still been too cold for the children to sow any seeds, so when they wanted to come and help this week, we decided to go on an earthworm hunt. Over the last couple of years we’ve gradually increased the amount of organic matter in the soil by mulching (covering) it with layers of compost, when available, and leaf mould. The idea was to help the soil hold water better – very necessary last year in that long drought – and to help increase the many microoganisms that help make nutrients available to plants, and generally do a lot of our work for us. We thought it would also have increased the number of earthworms in the preschool bed, making it very likely they’d find some. 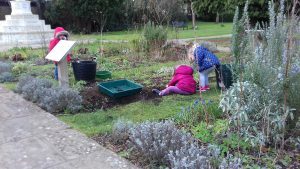 So last Monday, we again had two children helping to push a spade down into the bed, then pull backwards (with a little help from an adult holding the handle), so that a lump of earth rose out of the ground on the spade, and split slightly open to reveal a few wriggling earthworms inside it. Then we lowered it to the ground, and they dived in to find them, the bravest of them picking them up, the rest enjoying watching one on my hand. And once again, I’d thought they’d enjoy the digging and rifling through the soil, but I had no idea how entranced they’d be, just with the lump of ground rising up on the spade – there’s nothing like gardening with three-year-olds who’re seeing these everyday things for the first time, for making you see them as wonderful, too. And then they just wanted to dig until it was time to go back to the pavilion; some of them dug the earth along the edge of their bed, while a couple of others took turns to throw leaf mould from the trug onto the ground, which will help us repeat the cycle all over again. In theory, we don’t dig the ground in the gardens, as it’s much better not to keep breaking up all the mycorrhizal fungi and bacteria under the surface; but this an exception that’s really worth making, just to watch the children’s delight in their gardening. This entry was posted in Uncategorized on March 18, 2019 by foe.